Amelanchier lamarckii is a small, tough yet graceful, bushy tree or large shrub ideal for an exposed or difficult position. April brings a profusion of star-shaped, white flowers with bronze tinged young leaves, followed later in the year by striking red autumn colour. Purple-black berries which ripen in summer, are popular with hungry birds and also edible. In comparison to the other Amelanchier varieties, such as 'Ballerina' and 'Robin Hill', Amelanchier lamarckii is a slightly bushier, natural looking form. A height and spread of 4 x 3 metres in 20 years can be expected in its natural form. Due to the popularity of Amelanchier lamarkii, we stock a wide range of sizes and forms including a very popular multi stem tree. This variety of Snowy Mespilus has the RHS Award of Garden Merit. Our pot grown Snowy Mespilus trees can be planted at any time of the year. Start by removing weeds and grass within a metre of your desired planting hole. Dig a square hole as deep as your root mass and approximately 2x as wide. To help the tree establish more effectively, sprinkle root grow in the hole. Remove the pot, gently loosen the roots and place into the planting hole. Mix 50% of the original soil with 50% compost, fill in the hole and firm around gently. Avoid banking the soil up around the collar of the tree. 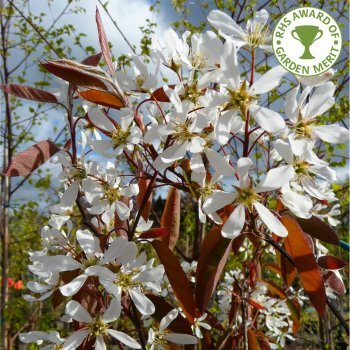 Unless it's a bush, clump or multi-stem form, we recommend planting Amelanchier trees with a stake and tie - instructions are in the planting guide. If you’re planting Snowy Mespilus in spring or summer, water well for the first few months. Increase watering if there are extended periods of hot or dry weather. If planting in autumn, you may only need to water a little. Snowy Mespilus require minimal pruning and you can just remove crossing, diseased or untidy looking branches. Juneberry trees can handle hard pruning if desired but it will mean less flowering in the following spring, so we recommend leaving pruning until after flowering. A good tip when pruning Juneberry trees is to remove any growth that is older than four years as this will improve the shape of your tree and encourage fresh bud and flower growth.